Wondering about the why’s and how’s of OST to MSG conversion? Let’s brief you out about what these are and then dive into how to convert OST emails to MSG format. To begin with, OST or Offline Storage Table files are a replica of Exchange Server mailboxes in the local PCs. OST files permit its users to access the mailbox without having to take recourse of the server. So, with OST files, you’ll be able to view emails, contacts, calendar, etc. without connecting to the server. One can work offline, and the mailbox automatically gets updated when the server is connected. An MSG file is an individual message most likely extracted from a PST file and contains mail data (along with a header, an email body, hyperlinks, email properties, and so on) in the form of ASCII text,. Select the saving location and provide a file name. Click Save. Users can easily save emails to MSG files from any version of Outlook via drag & drop function which is used to create a single MSG file of an Outlook email. Convert OST to PST/DBX/MSG/EML: With Recoveryfix OST to PST Converter, you can quickly recover Exchange mailbox data from OST files. In order that you may regain inaccessible data to Outlook, you’ll have to convert OST to PST or any other format. No data loss: Recoveryfix OST to PST Converter offers complete conversion of OST to PST file without any data loss. Preview: Recoveryfix OST to PST Converter permits its users to preview all items of an OST file, i.e. the user can easily check and see the content of the OST file including emails, contact, calendars, contact, etc. Recover: The tool offers preview of those items that are in the Deleted Items folder and recovers permanently deleted items quickly. Save: Enables to save inaccessible OST data to either Outlook or Outlook Express – the whole file or specific folders can be saved in accordance with the user’s requirement. 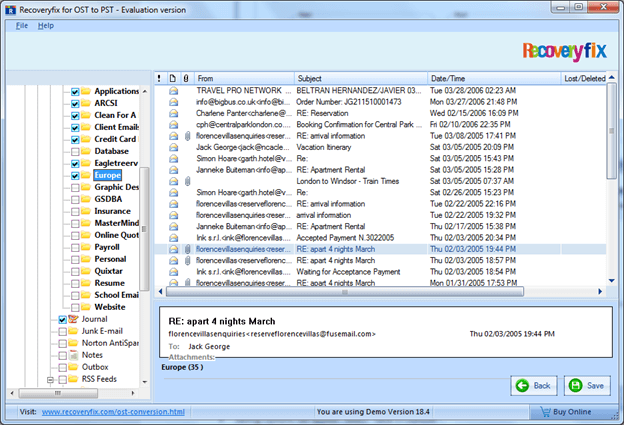 The tool converts OST data to PST, MSG, DBX, and EML files. Also, it can save OST file into numerous PST files. 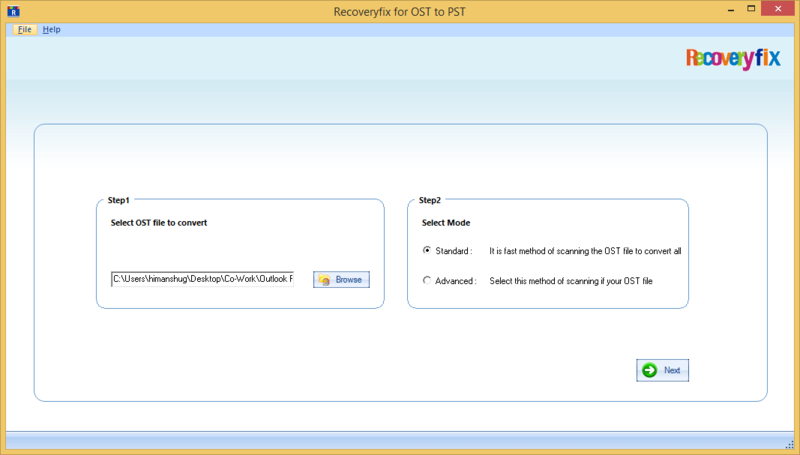 Open the Recoveryfix OST to PST Converter. Select the file you wish to convert. Now, select the mode: Standard or Advanced. Click on Next. Select the folders you need convert. Click Save. The Saving Options tab appear. Select “Save in Outlook”. Now, select “Save in MSG” and select the saving path. Browse for folder to save. (in case you need to maintain the hierarchy, tick-mark the option.) Finally, select click “OK”. Finally, the saving process begins. Your MSG files are saved in the folder you had chosen to save. 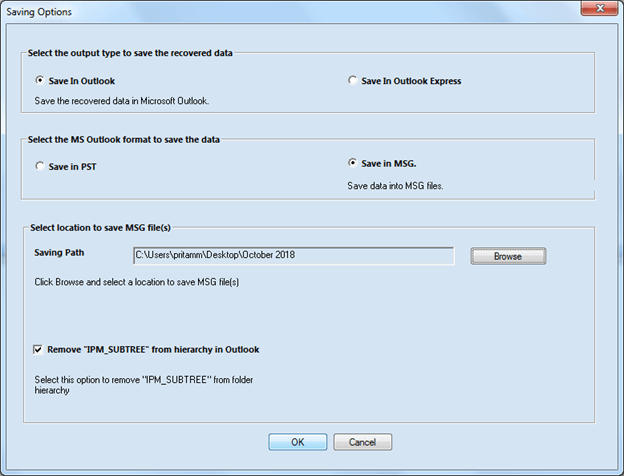 Your OST emails can be saved as MSG files from Outlook. But when you have a large number of emails, Recoveryfix OST to PST Converter is your best option for converting OST files to MSG files.